China’s Koogeek is one of the lesser known names when it comes to IoT-based smart home gadgets. Alphanzo Inc, a New Delhi-based national distributor, has been appointed to sell Koogeek’s products in the Indian market. Its catalogue for India includes a wide range of smart home gadgets including an LED bulb, an RGB light switch, a padlock, a door sensor, an E27 bulb socket adapter, and some IoT-enabled switches. Most of Koogeek’s range of products is certified by Apple and compatible with the HomeKit SDK, including the two products we are testing today. The Koogeek Wi-Fi-enabled LB1 smart bulb is priced at Rs. 2,950 and the Wi-Fi-enabled LS1 smart light strip has a tag of Rs. 3,363 in India. One of the highlights of Koogeek’s range is that it does not require a central hub to be operated, for an additional level of convenience. The Koogeek LB1 is an 8 Watt LED light bulb that works like any other but offers smart control features. To get it running, you just need to plug it into an EU-standard 200-230V screw-type E27 bulb socket (the kind where you have to twist the bulb a few times to get it into its place) which the majority of households may not have. If you have a ‘regular’ socket, you can buy a converter online or offline for a small amount. Once the bulb has been switched on, open the Koogeek Home app on your iOS device and scan the code on the pamphlet in the box or on the device itself. The LB1 comes with support for Siri and Apple’s HomeKit, but according to Koogeek, it will support Google Assistant and Amazon’s Alexa assistant in the future. The company also says the bulb isn’t suitable for use outdoors, and certain enclosures or shades might obstruct its Wi-Fi reception. 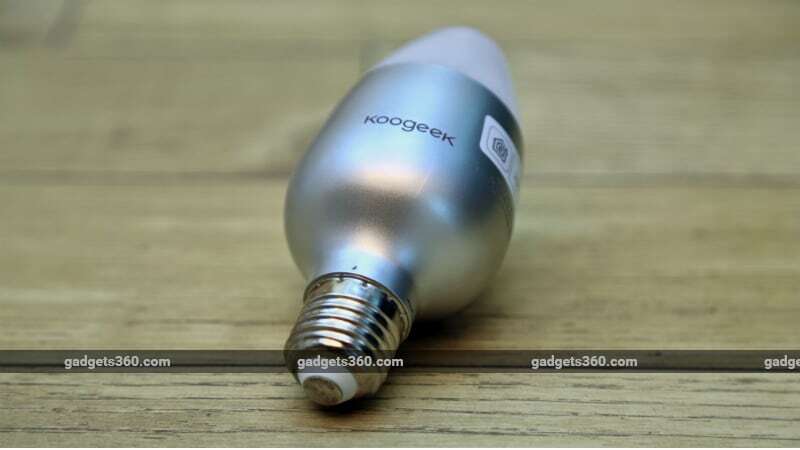 The Koogeek LB1’s build quality is impressive, and is comparable to that of the Philips Hue E27 smart bulb. It fits into suitable sockets quite easily and can be removed with equal ease. It is designed to not heat up much, but we found that the LB1’s exterior got considerably warm after about 20-30 minutes of continuous use. The bulb has a rated lifetime of 25,000 hours, which means that if it is used for about 8 hours a day, it should be able to last for more than 8 years – well that’s what the claim is and we obviously haven’t verified that. Koogeek says this 8W LED bulb is equivalent to a 60W incandescent bulb. Disappointingly, though, the LB1 has a rated luminous flux of only 500 lumens. For comparison, the Philips Hue is rated at 800 lumens. The colour temperature ranges from 2,700K to 6,000K, which is fine. The 2m long LS1 light strip has a total of 60 LEDs, placed equidistant to each other. It complements the LB1 LED bulb with a similar maximum luminous flux rating of 500 lumens. 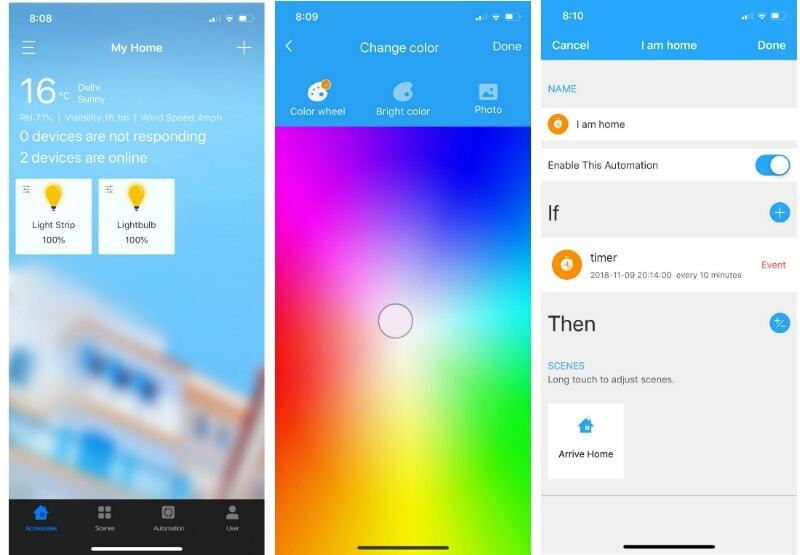 In addition to being controlled through the Koogeek iOS app and Apple’s Home app/ Siri, the light strip does support Google Home and Alexa, according to Koogeek’s website. On one end, it has a controller with a USB plug for power and a button that you can use to turn it on or off. It will work with any USB power adapter capable of delivering at least 5V/2A. The back of the strip is adhesive, so you can stick it to your furniture or any surface after peeling off the protective paper. There are markings where you can safely cut it with a pair of scissors, but you can’t daisy-chain multiple strips. The LS1 light strip has an IP65 rating for water resistance but Koogeek says it isn’t advisable to use it in a bathroom. We also found that it heated up slightly after more than an hour of continuous usage. The Koogeek devices use Wi-Fi b/g/n but work only on the 2.4GHz band, and you will need to disconnect your phone from a 5GHz network before attempting pairing. This turned out to be a bit of a hassle during setup, and we had to reset the bulb a couple of times before it finally worked. Bluetooth must also remain on during the setup process, but it isn’t required when using either of these gadgets. You can use the Koogeek Home iOS app or the native Home app on your iOS device to control the LB1 bulb and LS1 light strip. The main screen of the Koogeek Home app shows a list of all your paired smart devices with on/ off toggle shortcuts right on their respective icons. There’s a small Settings button on the top left of each icon, but we found it to be too small. As a result, when attempting to adjust the colour of the smart bulb or light strip, we ended up accidentally switching them off one too many times. Using the app, you can choose from 16 million colours — either through the shortcuts given or using a colour wheel to get the most accurate result. A bar for brightness comes up when you long-press a device’s icon. You can even adjust the temperature of the colour being used — making it warm for a cosy environment or bright for a party-like atmosphere. Another great addition is the ability to choose a photo from your gallery and have the bulb light up with prominent colours from it. For instance, we uploaded a photo of a sunset, which made the bulb and light strip create a sunset effect in our room. Both the LB1 bulb and the LS1 light strip are supposed to remember the last colour you selected when you switch them off from the mains. However, they did reset the colour back to the previous one a couple of times, usually when we switched colours just a few seconds before turning them off. This isn’t generally a problem. We also didn’t have any trouble with Wi-Fi range or disconnections. The second tab in the app lets you create scenes for automatic lighting control. Four scenes are available by default — Good Night, Arrive Home, Leave Home, and Good Morning. You can customise these by adjusting the colour, temperature, and brightness. You can also create new scenes by specifying these settings or choosing a photo. From the Scenes tab, users can group two or more Koogeek smart home gadgets to work simultaneously. While these scenes are useful, they are definitely not on par with the kind of customisations that Philips offers. The Philips Hue system allows you to customise lighting effects based on the weather, time, songs, videos, and more. One limitation of Koogeek’s app is that you cannot sync two or more smart devices unless they are part of the same scene. This can be done easily by merging them in Apple’s Home app, but in that case, you only get a limited number of colour settings. The third tab of the Koogeek Home app lets you set up timers for scenes. One of the presets offered is “I am home”. Using this, we set a timer for around the time we usually get home from work, and found both the LB1 and the LS1 lighting up to the exact scene we wanted. You can create your own automation settings, the possibilities for which are endless. Swiping left on any of the automations reveals “Enable” and “Delete” shortcuts. The last tab is for your user profile and other miscellaneous things such as the company’s About section, a Koogeek Store, tutorials for Alexa and Google Assistant, and a Units toggle for Celsius/ Fahrenheit. A Koogeek account is not mandatory to use the app and gadgets, but logging in does let you sync your scenes and automations across devices. Apple and HomeKit compatibility means that Koogeek’s range of devices can also be controlled by voice commands using Siri. Both can respond to basic instructions, such as changing their brightness, colours, and temperature. You can also use Siri to change scenes in the app. Both the LB1 bulb and LS1 light strip are great value propositions. They’re built well and are easy to set up and use. They can be considered over more expensive options from Philips, if you are deep into the Apple ecosystem and all you want is a simple solution on a budget. The lack of Google Assitant/ Alexa support on the bulb will be disappointing for most users in India. 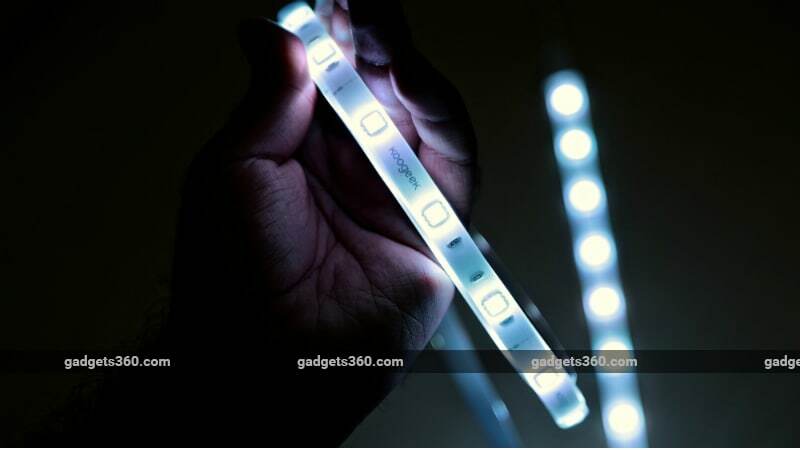 The Koogeek LB1 smart light bulb, LS1 smart light strip, and several other smart home gadgets are available via the India distributor’s official website.